Halloween is my favorite, and these devilish Halloween deviled eggs are the first of three spooky recipes I have for you this week. Plus there’s a giveaway you won’t want to miss! 5.5 The Great #HalloweenTreatsWeek Round Up for Monday! I truly love deviled eggs, y’all. Almost as much as pimento cheese. Almost. These Halloween deviled eggs get their devilishness from garlic, horseradish, and Sriracha, and they are very more-ish. 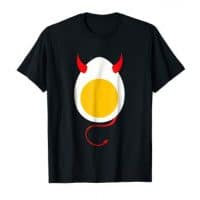 Deviled eggs are very easy to make, but sometimes folks have trouble hard boiling their eggs to make them. Let’s take a look at what I think is the best way to hard boil eggs, and then we’ll make these little dudes, okay? Place your eggs in a 3 quart saucepan in an even layer. I can fit a dozen eggs in my 3 quart saucepan, but of course you can use a smaller pan if you want to boil fewer eggs. Cover with cold water by about an inch. Put the lid on the pan and bring to a low boil. Not just a high simmer with small bubbles, but a true low boil with large bubbles surfacing rather violently, so keep an eye on them. As the water is heating, stir the eggs occasionally to keep the yolks from settling to one side or the other. You want the yolks to be suspended as close to the center of the whites so you don’t end up with lopsided deviled eggs. When your eggs have come to a low boil, remove them from the heat, and put the lid back on the pot. Set your timer for 15 minutes. Fill a large bowl with ice and then add cold water. When the timer goes off, fish out your eggs with a large spider strainer and submerge them in the waiting ice bath. Check out the texture on the outsides of the eggs, you guys. You really can’t see it once they’re cut and deviled, but it’s still cool. Here’s how you make that happen. Allow the eggs to cool in the ice bath for about 45 minutes. 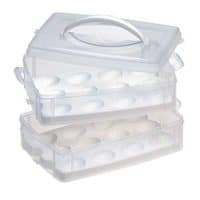 Take the eggs out of the ice bath and put them in another bowl. Refrigerate them on a lower shelf in your fridge (where it’s coldest) overnight. See “how to peel hard boiled eggs” below. What happens is that there is just a tiny bit of water that gets trapped between the shell and the hard cooked egg. By getting them super cold in the ice bath for 45 minutes or so and then letting them hang out in the coldest part of the fridge, that tiny bit of water will freeze without actually freezing the egg itself. When you peel the egg, the lacy ice inside will have left creepy imprints in the whites. Super easy! And as a bonus, the eggs are very easy to peel since the ice makes space between the shell and the white. Very little sticking. Nice! Slice eggs in half and scoop out the yolks into a bowl. 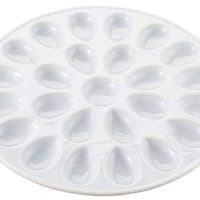 Mix up all the filling ingredients, put into a piping bag or a zip top bag and snip off a corner and pipe the filling evenly back into the waiting whites. To make the eyes, place 2 sliced olives (black or green) side by side on top of the deviled egg filling, and squirt a wee dot of Sriracha inside for the pupil. Hard cooked eggs can be a pain to peel because the membrane between the shell and the white can be stubborn. And you might curse. To minimize any cursing. tap the egg all over on the counter to crack the shell. Not just in one place, but cracked all around. Start peeling the egg at the rounded end, because this is usually where there’s an air pocket. It can also help to peel your eggs under running water, because that can help loosen the membrane. Peeling the “icy eggs” is really pretty easy because the ice will have forced the whites away from the shell. Of course, you’ll end up with that creepy textured outside, so you have to decide if that’s what you want or not. 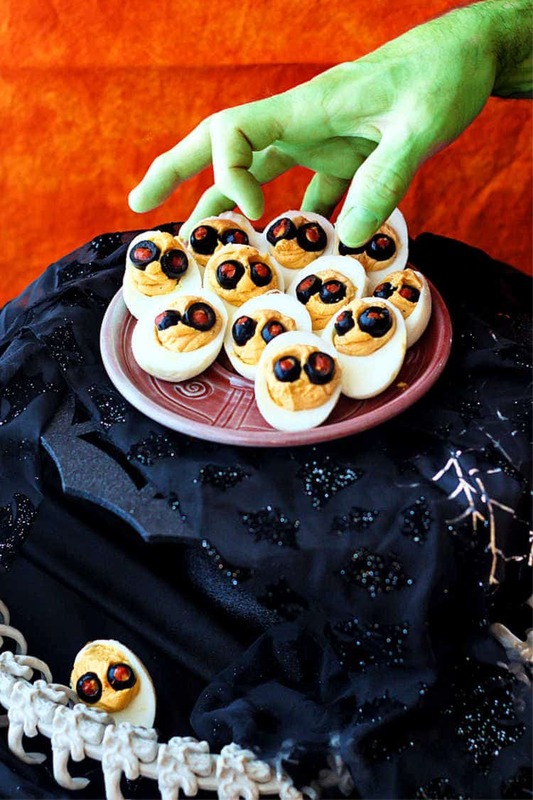 These deviled eggs are perfectly cutely-creepy for Halloween. Spiked with horseradish, garlic, Sriracha, and just a touch of liquid smoke, they’re not your mama’s deviled eggs! 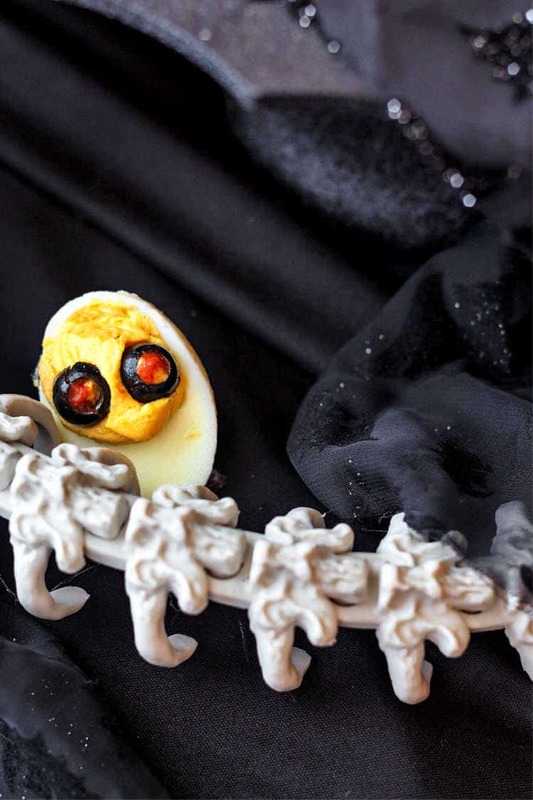 How to Make Halloween Deviled Eggs–Let’s Do This! Interested in another creepy deviled egg recipe. Check out these “Spider Eggs: Avocado and Wasabi Deviled Eggs” from my friend Laura over at Family Spice! 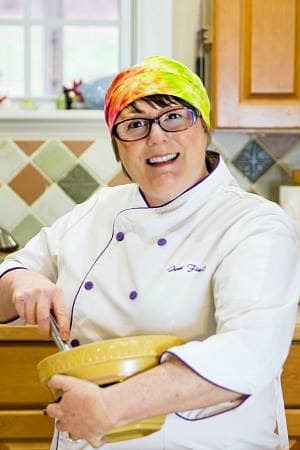 Dig this recipe? Consider rating it and/or commenting. I love hearing from readers, and I can’t wait to see how you make your creepy deviled eggs! 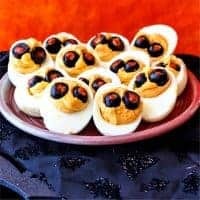 These Halloween Deviled Eggs are easy to make, have a creepy, textured outside, and are also excellent. 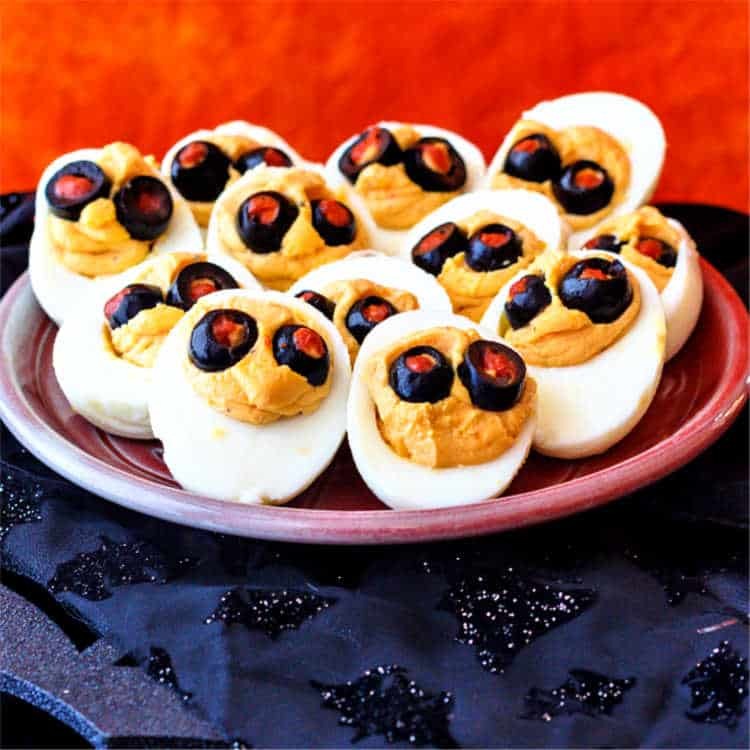 Make them for Halloween or for any occasion that calls for deviled eggs. 48 slices black olives, for "irises"
Carefully scoop out the cooked yolks from the sliced eggs and place in a small bowl. Place the filling in a zip top bag and snip off about 1/4" of one corner. Pipe the filling evenly into the hole in each white. Make a dot of Sriracha inside each slice to make the pupil. Refrigerate until ready to serve. Will keep in the fridge for 3-4 days. You can add some very finely minced crisp bacon to the mix if you'd like. I didn't because I was already using liquid smoke, but horseradish and bacon is a great combination. Pretty good, right? These are definitely not your everyday deviled eggs, which is fine with me. I mean, I like that kind, but these are lovely and smoky with a kick from the horseradish. I do hope you make them. Don’t look now, but your deviled egg is looking at you with its olive and Sriracha eyeballs! If you make these, and I really hope you do, please share a photo with me either on Instagram by tagging @onlinepastrychef and using hashtag #pcorecipe or share in the Pastry Chef Online Facebook Group. 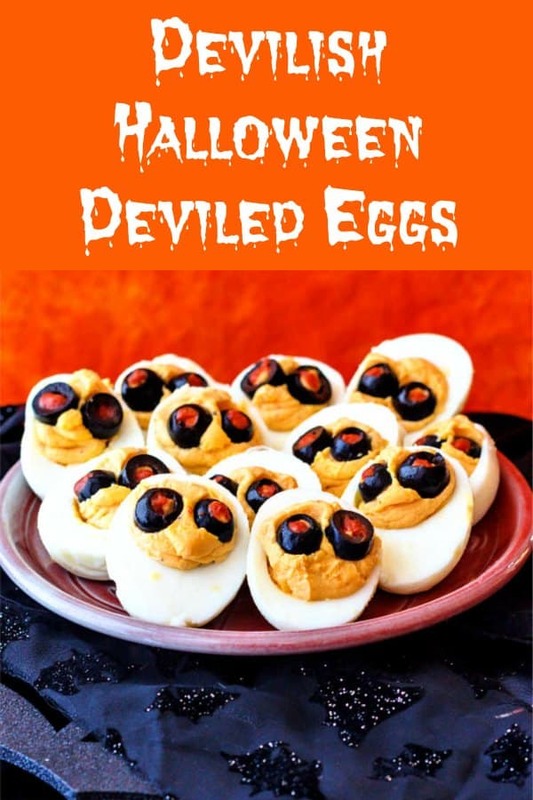 Can’t wait to see your devilish Halloween deviled eggs! The Great #HalloweenTreatsWeek Round Up for Monday! Disclaimer: These posts and recipes are part of the week-long event, #HalloweenTreatsWeek but all opinions are 100% mine! We would like to thank our amazing sponsors: Dixie Crystals, Adam’s Extract, Wilton, Sweets and Treats Shop and Treat Street USA ! These wonderful sponsors provided the prize packs for our giveaways and also sent samples and products to the #HalloweenTreatsWeek bloggers to use in their recipes. We appreciate it so much! Thank you for spending some time with us today. Take care, have a lovely day, and I hope you have the best Halloween! All of your tips for perfect hard boiled eggs are amazing. It’s like getting my master’s in hard boiled eggs. Love your hand model! I love deviled eggs and the addition of garlic, horseradish and siracha sounds amazing! Plus I love your egg boiling tips! Thanks! Honestly, the ice thing happened by happy accident this time, but they looked so creepy they were perfect for Halloween eggs, plus they were so easy to peel! I appreciate all your tips to ensure hard boiled egg perfection! I always end up peeling half the egg off when I peel the shell. Oops! Yours look perfect and I love the flavors you picked! Ooo, I really like how these turned out. I’m giggling at the green hand too! Loving these eggs! So fun. I’ve never thought to add liquid smoke to deviled eggs. I’ve got to try that and the sriracha next time. I considered adding bacon, but I thought they already had enough flavor going on, so Liquid Smoke was my bacon sub! 🙂 Hope you enjoy them!